Trailer-mounted concrete pumps as supplied by Utranazz come in an array of outputs ranging from 15 cubic metres to 120 cubic metres per hour over distances of 380m (with additional boom line). 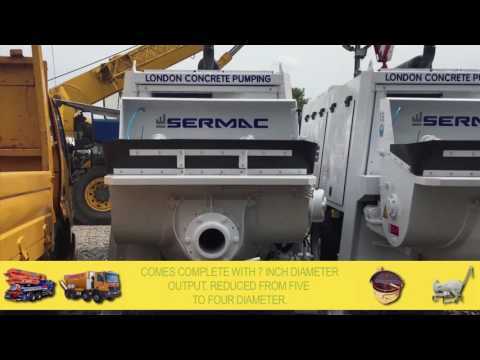 Our trailer-mounted concrete pumps offer the ideal solution for placing concrete or shotcrete in hard–to-access areas because of their compact size, they can also be used as an alternative to truck-mounted concrete pumps on larger pours that require a slower output rate. The new TB40/T is a lightweight, compact, road-towing trailer pump that is available exclusively in the UK. Its combination of powerful pumping, at 40m3/hour, and small size make it perfect for contractors undertaking multiple pours in a day. All of the trailer-mounted concrete pumps can be fitted with a variety of water-cooled or air-cooled engines and come complete with an array of accessories and optional extras. The TB40/T is fitted with the new stage 3B, Tier 4 engine. All of our trailer pumps come supplied with Autec Radio Remote Controls.